"Um, hi. Remember when I called a while ago, and asked for directions to Buffalo? I may not have been specific enough." Hunting along the Oregon Trail was almost too easy sometimes. 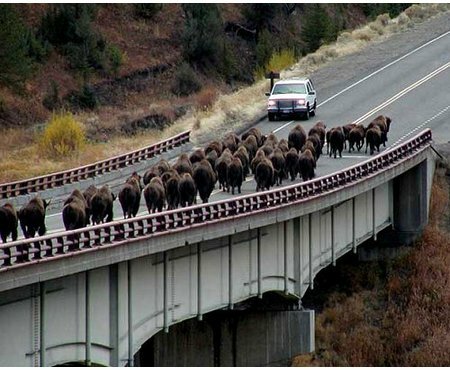 The buffaloes crossed the bridge slowly and carefully, knowing that any sudden move or loud noise could cause the Bronco to stampede. Thanks to a timely distraction by their buffalo allies, the green trees launch an undetected flank attack on the white SUV while their orange brethren lie in wait just out of view. "Excuse me, good sirs. I've been driving around for hours. Could you please tell me where the local steakhouse is?" First the white man took his land. And now Sitting Bull's final hunt was ruined by the painful realization that he couldn't drive stick.